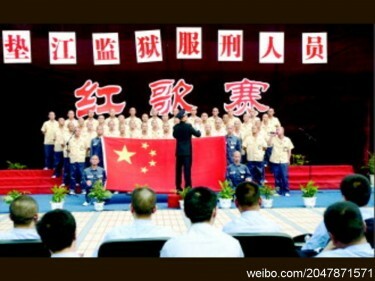 Before Chongqing Party Secretary Bo Xilai launched his Red Songs campaign this year, the latest component of his larger ‘red revival’ scheme which began in 2008, prisons in the city had begun promoting “red culture” as a way to rehabilitate inmates. 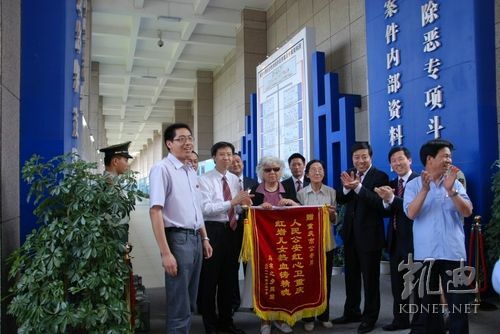 More recently, a larger and more structured ‘reducation’ program which developed from the Chongqing model has been implemented in Yuzhang Prison in Nanchang, Jiangxi province. 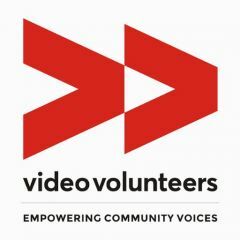 …a full-out launch in the prison of a series of red-themed activities, including “red” teleplay and film screenings, “red”-themed lectures, model “red” education activities, “red”-themed discussions, “red” knowledge testing, “red” education evaluations and “red” event award ceremonies, the goal of all of which is to push for a higher quality reform through education. A perhaps daring move trying to push all this on the inmates at Yuzhang Prison, if you consider that 90% of them are serving commuted death sentences, or what ideas a neo-Maoist mass revolutionary education might give to several thousand [zh] potentially dangerous ex-convicts. One hundred red songs chosen in Chongqing, more than 80,000 classic red books purchased, over 300 red films screened and over 1,200 red story storytelling sessions. Inmates have to sing red songs, read red books, watch red films, write red inspirational decrees, hold red-topic lectures…..
Others point out that Chinese students at every level of China's education system still receive their fair share of red education and the closest they seem to have gotten to any kind of mass movement is group buy. 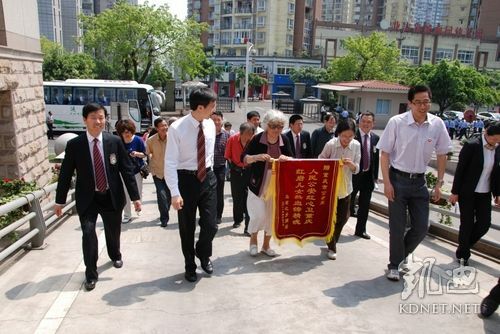 A Legal Daily article that seems to have been one of the earliest sources for news of the campaign offers a few more details, such as that descendants of former red soldiers were invited as special guests to Yuzhang Prison's red culture launch party, inmates are having their terms reduced for red behavior, and that preparations began in April following decision by the Jiangxi Bureau of Prison Administration Bureau to introduce the program to all prisons in the province. - Do you get released or have your sentence reduced once you finish singing the red songs? – Damn, spread this news around, these guys are gonna be great thugs when they get let out, I've never felt this scared before. – None of this was paid for using taxpayer money, right? – This is like a mental pyramid scheme. I hope Bo doesn't make it into the 18th Politburo, or else this is gonna end up a tragedy. – Heh, the latest masterpiece from the brainwashing experts. 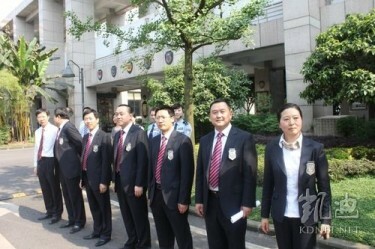 Going earlier, on March 27 in Chongqing, the Ministry of Justice convened a meeting to discuss “moving red culture into the prisons” with prison system cadres. At the meeting, it was decided [zh] to expand the red culture program from Chongqing Municipality and Jiangxi province to prisons in four additional provinces (Shaanxi, Hubei, Hunan and Sichuan) which, netizens pointed out, are some of the poorest in the country. 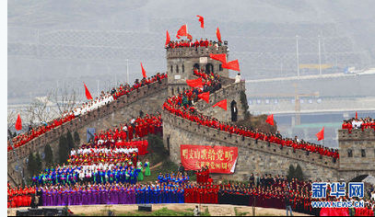 “It's 2011, have we entered the ‘New Red Song Era'?” From the trade union congress in Shaanxi to courts in Tianjin, prisons in Yan'an and all over have started singing red songs, and campuses everywhere are the front line for singing red songs. Experts say this shows that Chinese society is in a transition, and faces conflicts and crises of every sort, a manifestation of the ruling party's search for the values that shape society. Are red songs enough to keep Chinese people today believing? People singing red songs everywhere, a prison in Jiangxi says it uses red songs to reform prisoners, classic relics from the Cultural Revolution. Our elders sang their fair share of red songs, no doubt. What good will it do? Everything we see, hear and eat is all poisonous milk powder, poisonous meat, poisonous bread. Sure, we could go and sing “light up my serf's heart”, but what we really hope for is some lightening up of our ‘mortgage slave’ hearts. Reconstructing the socialist ethical system is a complicated process, not something that can be done just by singing a few red songs. A prison in Jiangxi this year launched a red education initiative which includes singing red songs, reading red books, watching red films and writing red inspirational resolutions, etc. This is too much. The crime rate will definitely go far down. Once they're reformed, Jiangxi won't have any prisons left, they'll all have turned into mental health facilities. Once you finish your sentence you'll have to go to a mental hospital for further studies…..
We need to be vigilant against the spread of this! People will definitely never agree to that, you can relax. The red thing is definitely catching on. Or is it? 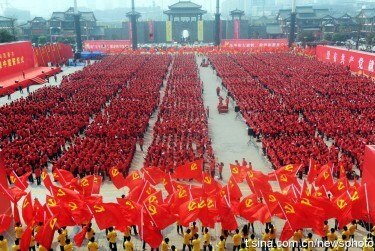 On March 28, 10,000 Communist Party of China members gathered in a square in Chongqing (see above) to renew their Party vows; there's now red volleyball and red tourism; a university in China's impoverished Henan province caused ripples last month when it started forcing students to enjoy red songs in the lunch cafeteria. 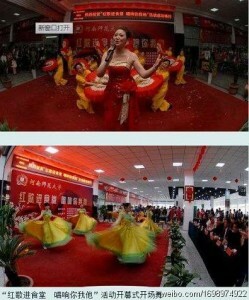 So now Jiangxi TV's “2011 China Red Song Gala” wants to play with inmates? They want to hold the competition inside a prison? Crazy! Prisons are willing to sacrifice prisoners’ privacy just for a chance to show off their human nature reform project? Can the prison even rightfully claim that as their own doing? How many people are actually going to be interested in peeking at singing convicts? Will prisoners’ tearful confessions become entertainment too? Such creativity, this TV station, they must have gotten jealous after seeing those prisoners in the Philippines dancing to Michael Jackson. That was a spontaneous event! You're playing with fire, be careful you don't end up getting cursed out by your audience! While netizens were still getting off the bus, a group led by comrade Zhou Jingping came out to greet us. Everyone headed straight for the “strike corruption, remove evil” exhibition hall. 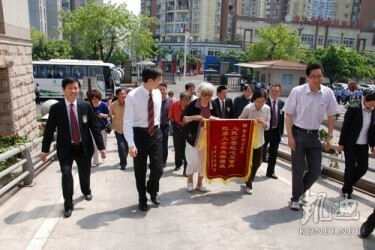 With netizens cheering, well-known netizens Red Women's Detachment, Wei Xin, eldest daughter of Wei Wei, author of “Who are the Most Beloved People”, and Utopia webmaster and comrade Fan Jinggang went forward as representatives of the Utopia website and the masses of red netizens to present the Chongqing PSB with a large red banner. On half of the Chongqing PSB, Director Zhou accepted this great honor which carries the hearts of hundreds of millions of the people! 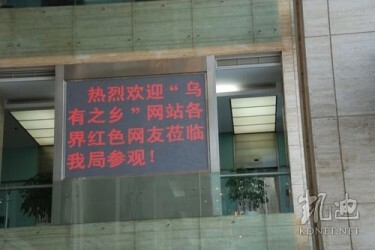 Written on the red banner in yellow letters was: “The red heart of the People's Public Security looks over Chongqing, cast with the blood and souls of the sons and daughters of the Red Crag“. Beneath the glowing, radiant, glorious and brilliant sun, one couldn't help but feel the warmth and intimacy—that feeling of returning home after a long absence. Netizens warmly shook hands with and said goodbyes to their guides from the Chongqing PSB, full of hatred and loathing for the black forces and profound empathy for the toiling masses. 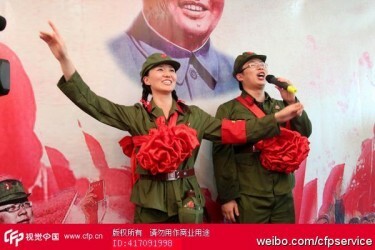 “Long live Chairman Mao!, Let's learn from the Chongqing people!,” and other slogans rang out again through the air. Thus netizens finished their visit and, full of faith, set out on a new path. With this visit, certain doubts in the hearts of comrades have been cleared away, and ideals and convictions reaffirmed, giving us a much more objective understanding of the fight which lays before us: only the force of an internally healthy Party's alignment with the masses has the power to change heaven and earth, and only with the masses of the People's utmost struggle for the strength of inner-Party health will we see a quick revival of the movement for grand Socialism. Comrade Bo Xilai has earnestly studied Mao Zedong thought and put the Party on the path of the masses, looking out for us, and the interests which benefit the People. The best proof of this is that relations between police and the People have been restored to the level seen during the Chairman Mao era. Comrade Bo Xilai said that there are a million steps in the road to revolution, and a return to basics is but one of them: full-hearted and full-minded service for the people. During the campaign to “strike corruption, remove evil”, more than 10,000 informants have stepped up from the masses, 80% of whom have done so using their real names. This is a people's war! 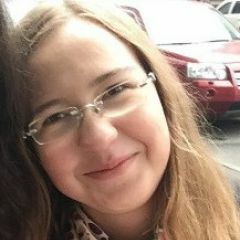 The future of the regime is at stake, most crucial now is popular support! 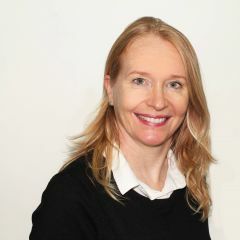 With the economic crisis since 2008, drastic changes have taken place in the international order, and the world has entered a period of massive readjustment. Conflicts within and without China have reached a critical point. 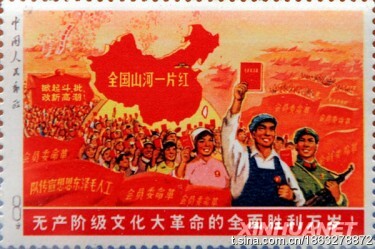 Domestic extreme rightists, supported by American imperialism, are vainly trying to use all resources available to them and the People's temporary dissatisfaction with the Party and the government to carry out their Jasmine Revolution, try and subvert the Republic, overthrow the Communist Party of China from its leadership position, and turn China into a full colony of the United States. This is something the Chinese masses will neither tolerate nor accept. Communist Party member comrade Bo Xilai, mandated by the possibility of defeat and commanded by threat of the disaster, has turned Chongqing toward the Party and the masses, and overcome major difficulties, searching far and wide to find the path back to Socialism. There's not a single one among the masses not now shouting, “The true Communist Party has returned!” Comrade Zhang Hongliang even made the timely observation that, “the Communist Party of China possesses the historical ability to renew itself”, and the united combination of Mao Zedong thought, the People and the Party serve as the strategic basis for our struggle. Excellent news. Remember what happened to China when this of kind of things happen ? Better get loaded with pop corns to enjoy the show.